Melania Trump's Parents Used Chain Migration to Gain U.S. Citizenship-Unproven! - Truth or Fiction? Melania Trump’s Parents Used Chain Migration to Gain U.S. Citizenship-Unproven! First Lady Melania Trump’s parents used what the White House refers to as “chain migration” to gain U.S. citizenship. There’s no way to determine whether Melania Trump’s have in fact become naturalized U.S. citizens. However, they would be able to maintain their Slovenian citizenship and still spend long periods of time in the United States because of an agreement that the two countries are part of. 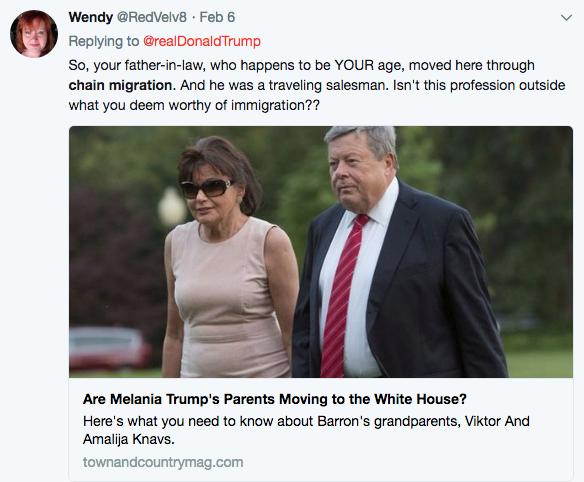 Rumors that Melania Trump’s parents used “chain migration” to gain U.S. citizenship flared up in February 2018. As the White House worked to reform immigration laws that enable certain family members of naturalized U.S. citizens to gain U.S. citizenship, claims about Melania Trump’s parents were used to portray President Trump as hypocritical. Unproven claims that Melania Trump’s parents used chain migration to gain U.S. citizenship surfaced in early 2018. Again, the immigration status of Viktor and Amalija Knavs isn’t public record. There’s no way to confirm or debunk these claims. Melania Trump’s parents do spend a fair amount of their time in their United States. They’ve reportedly split their time between Trump Tower and Mar-a-Lago over the years. There are also rumors that they live at the White House, much like Michelle Obama’s mother did. They regularly appear in photos there, and very involved in Barron Trump’s life. They also accompanied Melania and Barron when they moved in, Politico reports. But Viktor and Amlaija Knavs own a home in Slovenia, and they reportedly travel back there three or four times a year. And that’s an important detail for this rumor. The United States and Slovenia are both members of the Schengen Agreement. The agreement allows visa-free travel between member countries for up to 90 days at a time. Because the U.S. and Slovenia have both joined the agreement, Melania’s parents could easily maintain their Slovenian citizenship and live in the U.S. The Knavs’ frequent trips to Slovenia would support that theory.